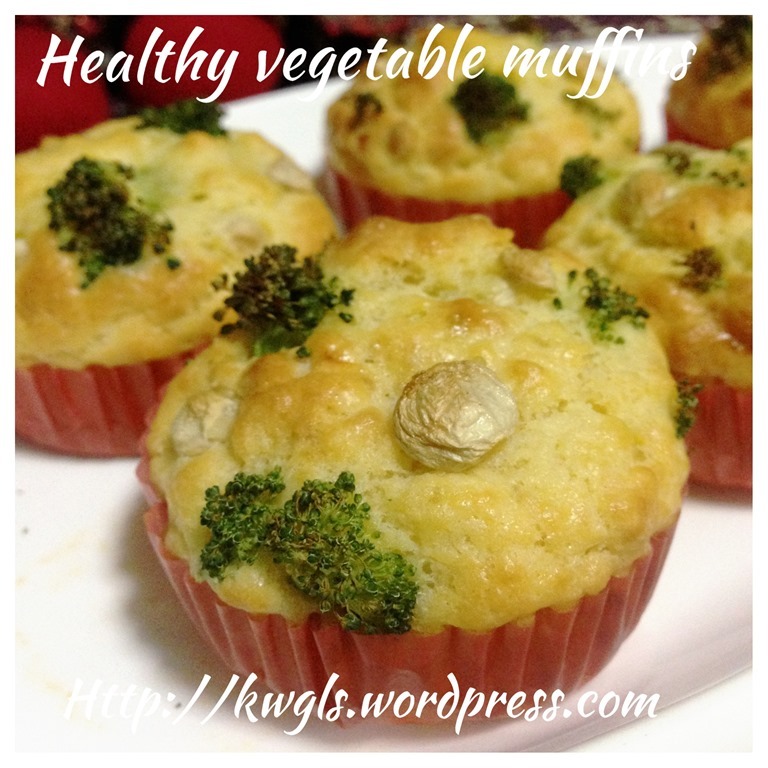 Have not prepared this for a year and in this attempt, I have transformed the muffin into a savoury muffins and reduce the olive oil used. Please refer to recipe 2 highlighted in red . If you are not a vegetarian, you can always add in cheeses and bacon or ham. 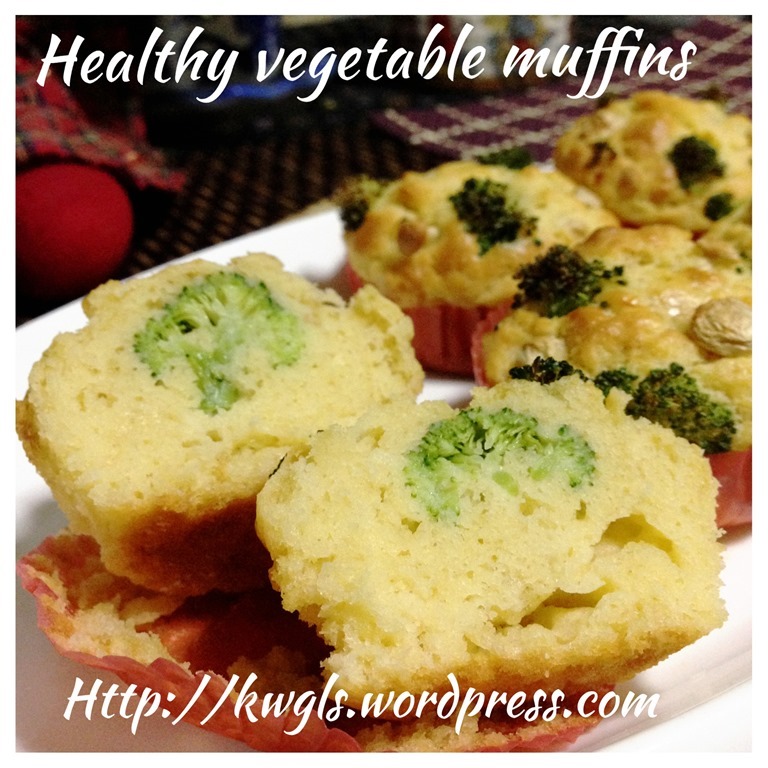 This is a healthier version of muffins. No complicated creaming of butter, folding of flours and etc. 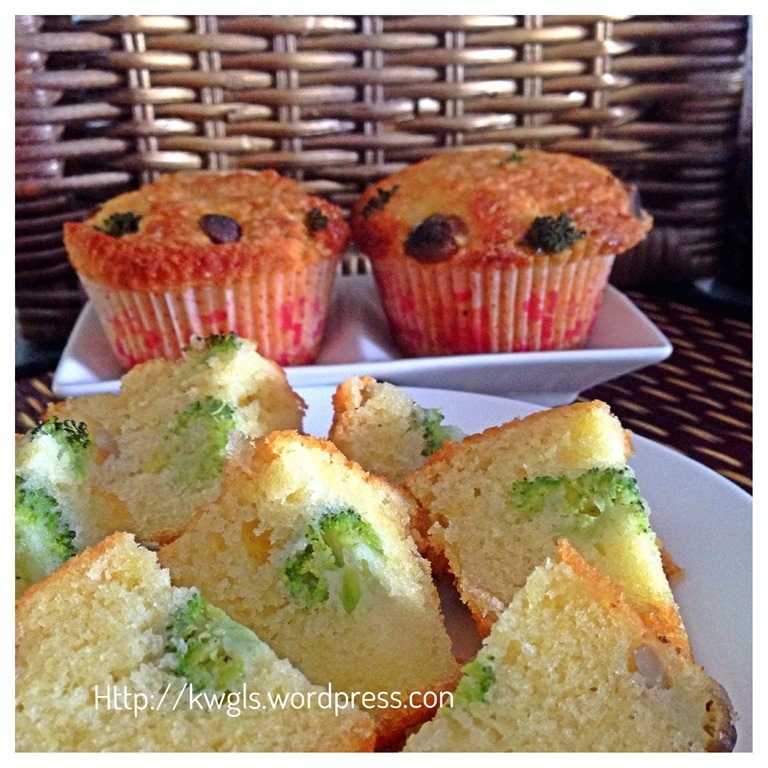 It is just a simple mix and bake muffins. In addition, to further testing the “simple” principle behind the theory, I have started with 100 grams of fats and all remaining volumes will be 100 grams. 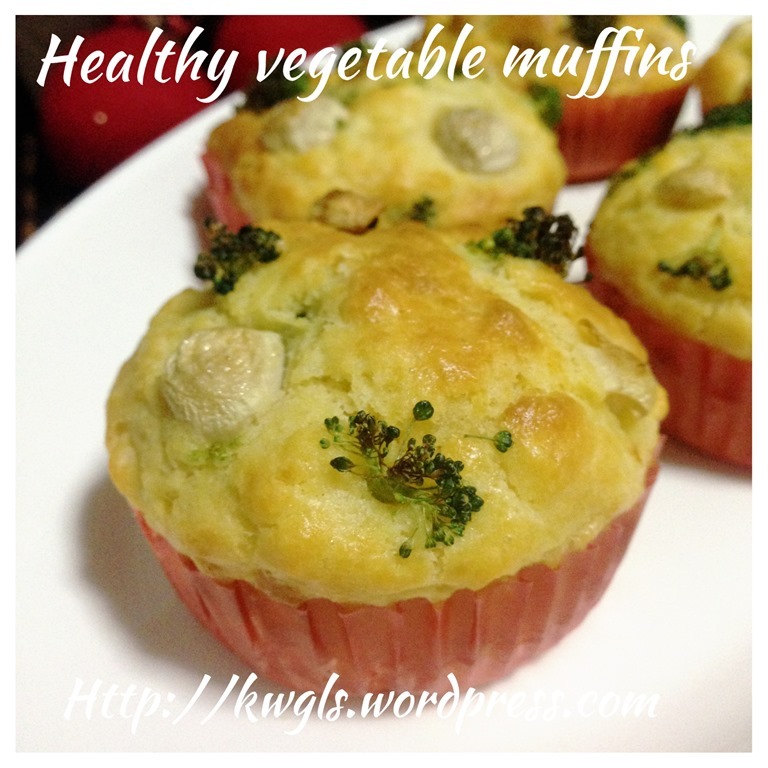 The muffin uses olive oil and the inclusion of some vegetables – mushrooms and broccoli. Is the results satisfactory? Yes, definitely yes. 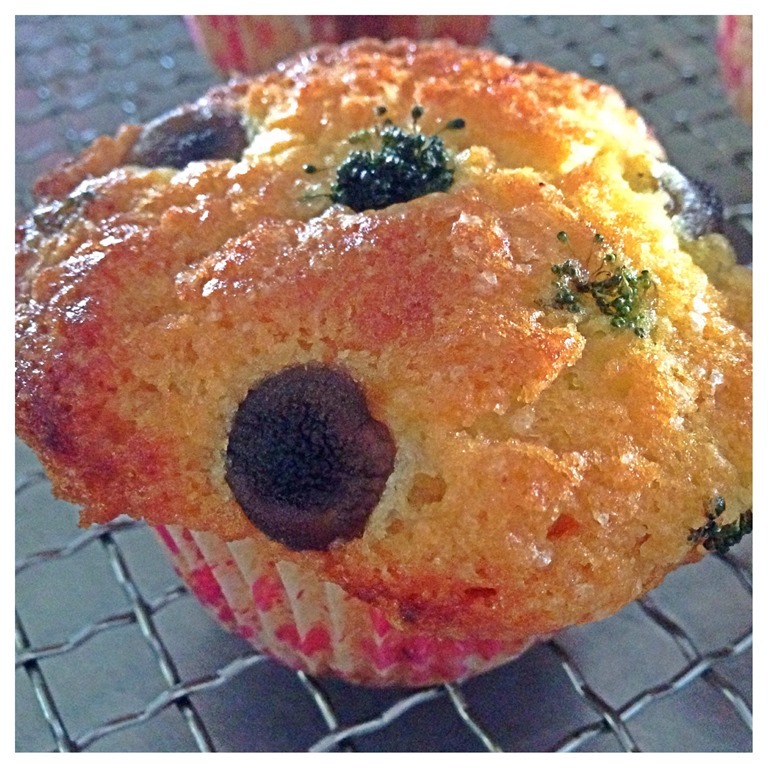 Not only the pattern insides the muffin looks pretty, the taste is awesome as well. 10 grams of sugar or any flavour enhancer that your are using now such as mushroom concentrate granules etc.. Please disregard ‘! !” in the picture as it is my mistake to include in the picture. 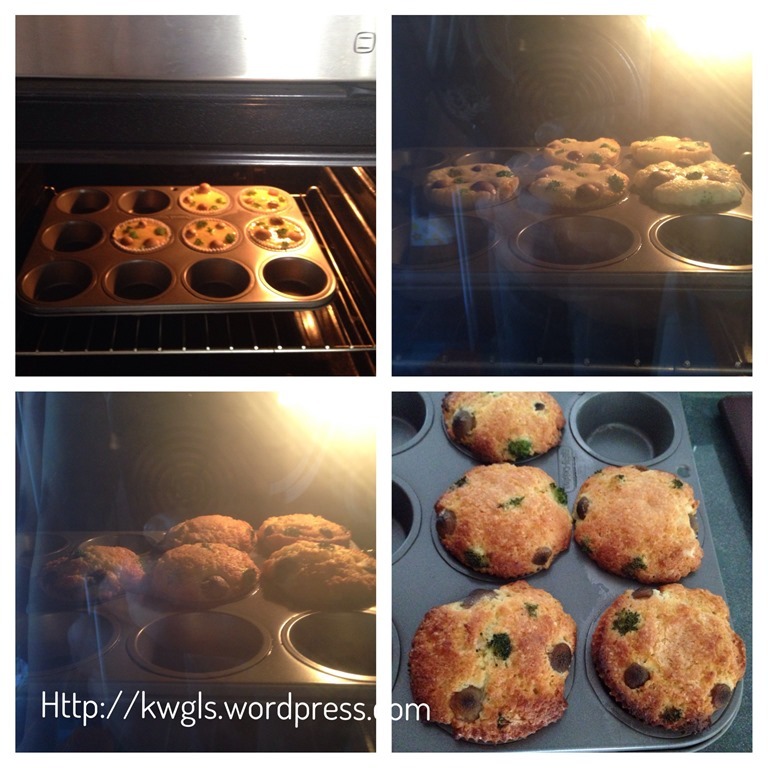 Lightly grease some muffin tins or get ready 5-6 muffin cups and put in the muffin tins. Shift the flour and add in the sugar. Stir until well mix. Make a well in the centre and put in eggs and olive oil. 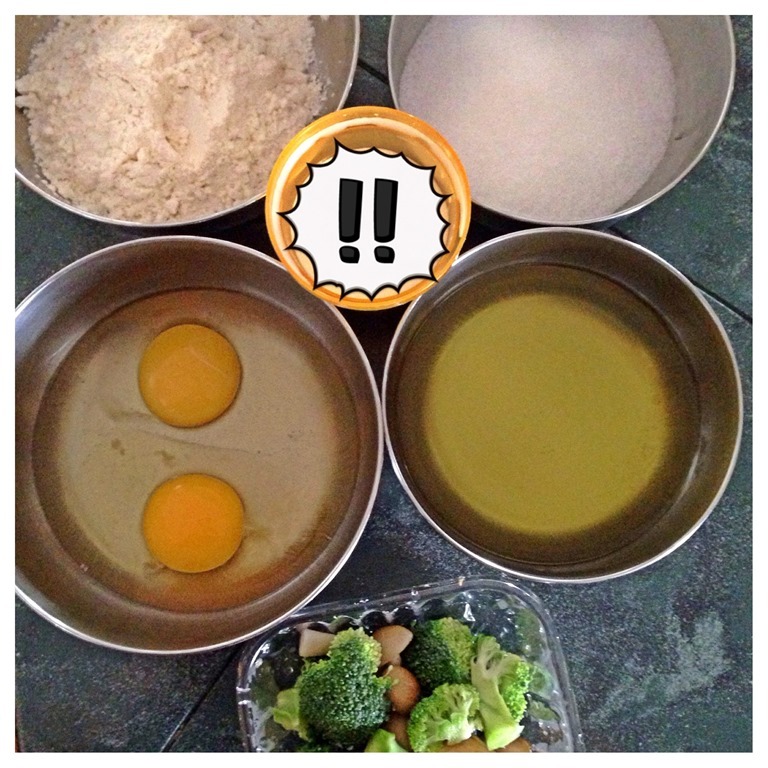 Stir lightly until it is “mix” and slight lumpy is okay for muffins. 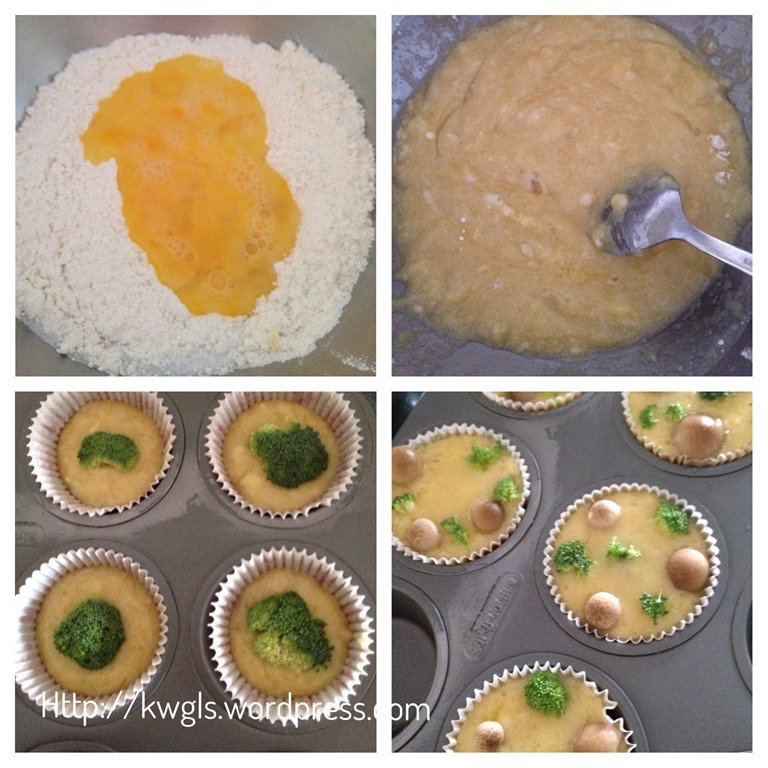 Filled up 1/3 of the muffins cup with batter, put one small size broccoli and ensure that it is surrounded by the batter. Continue to fill until the batter is 85% full. Top with additional broccoli and mushrooms. Bake in the oven at 180 degree Celsius for 15 to 20 minutes or when the skewer inserted comes out clean. 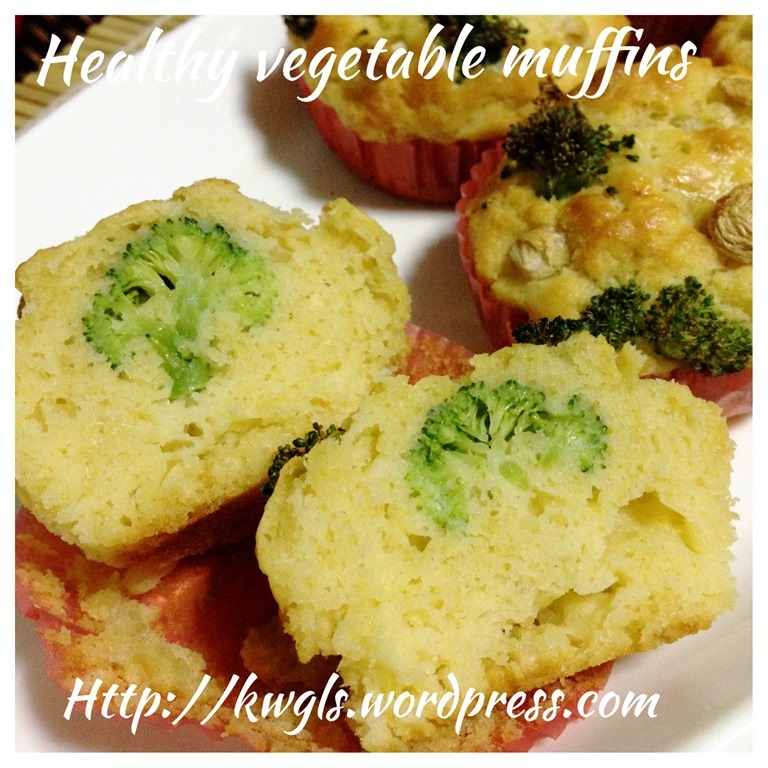 Note that the shape of your muffins will depend on the positioning of your vegetables. 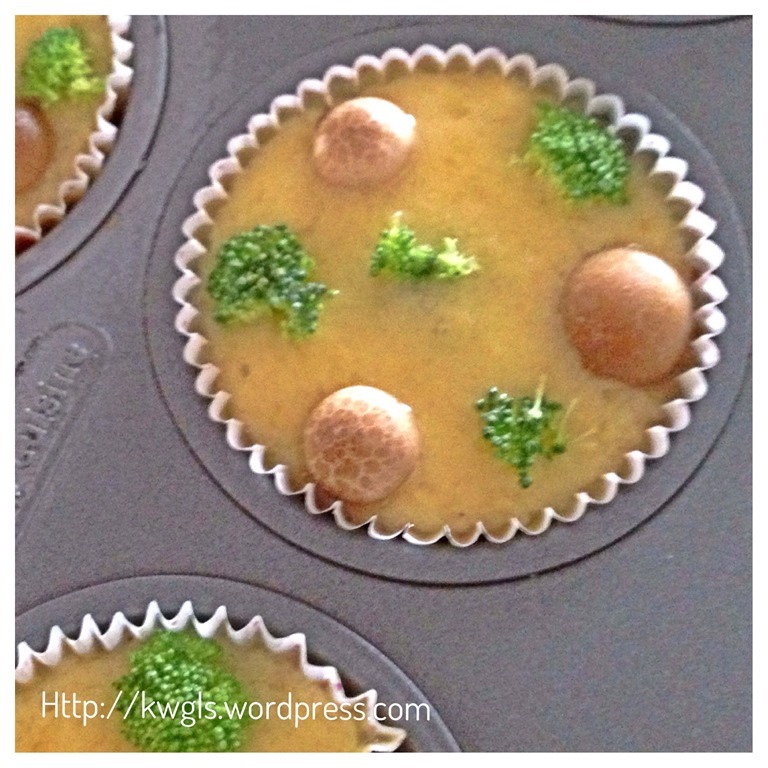 If you put the mushrooms too close to the muffin cups, you will have a funny shape muffins like the above picture. Of course, the taste is still awesome and edible. 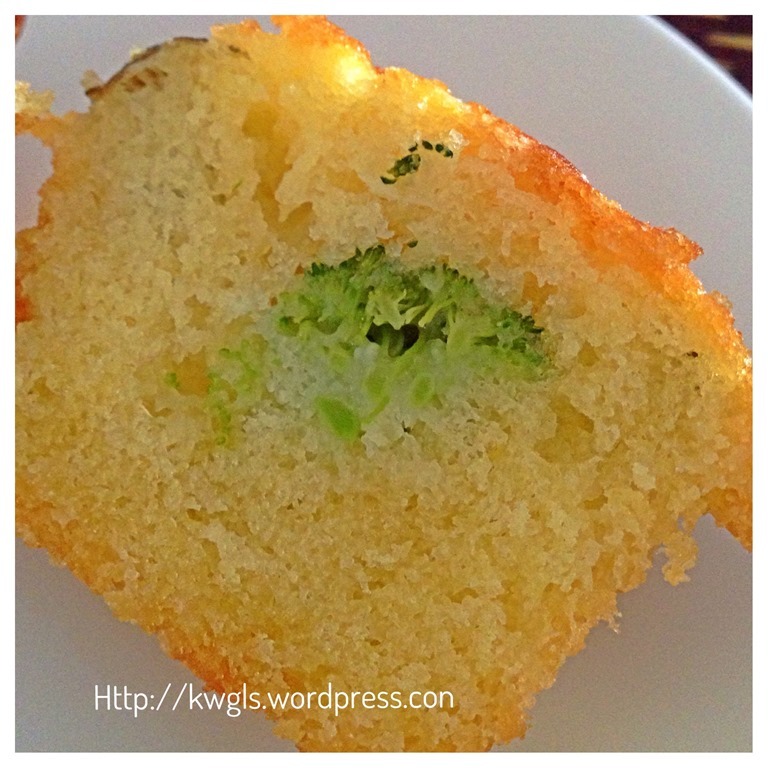 Try not to put big pieces of broccoli in the centre of the muffin batter as it will hinder the rise of the muffin. 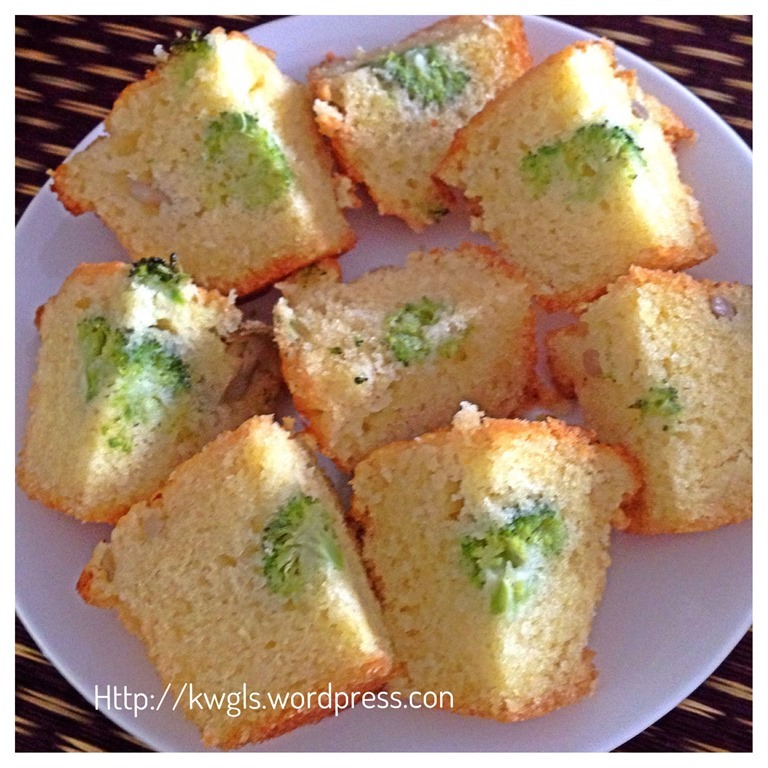 A simple, quick and easy recipe. It can be as healthy as you want it to be. 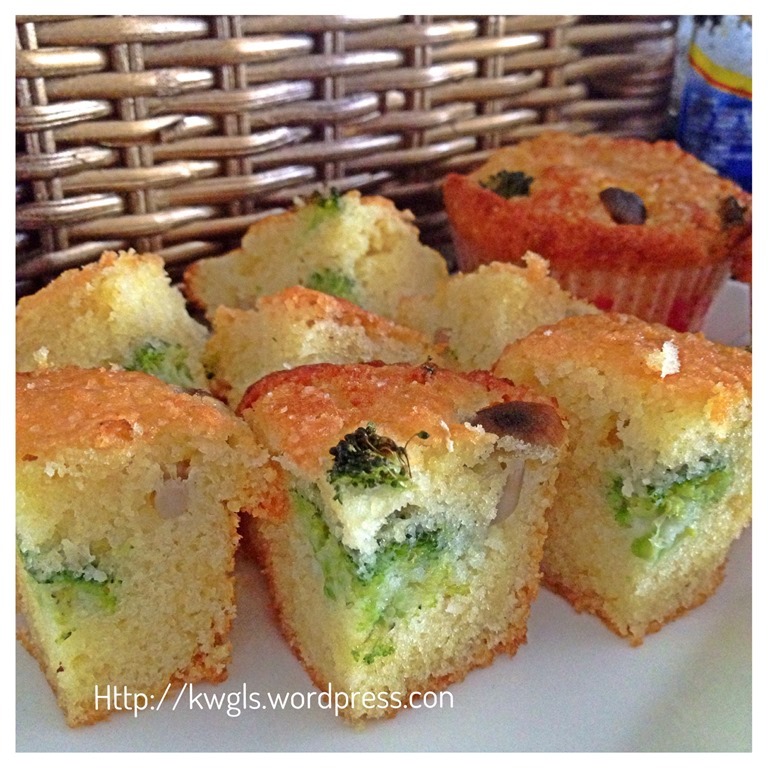 Try to substitute the self raising flour with wholemeal flour and you can get a wholemeal broccoli mushroom muffin. Run out of breakfast tomorrow? Why not making it today as it utilizes mostly common household ingredients. In addition, it is fast and easy. (updated as at 20 November 2014) here and you can follow me at PINTEREST or visit the blog’s FACEBOOK PAGE to keep abreast of my future posts. 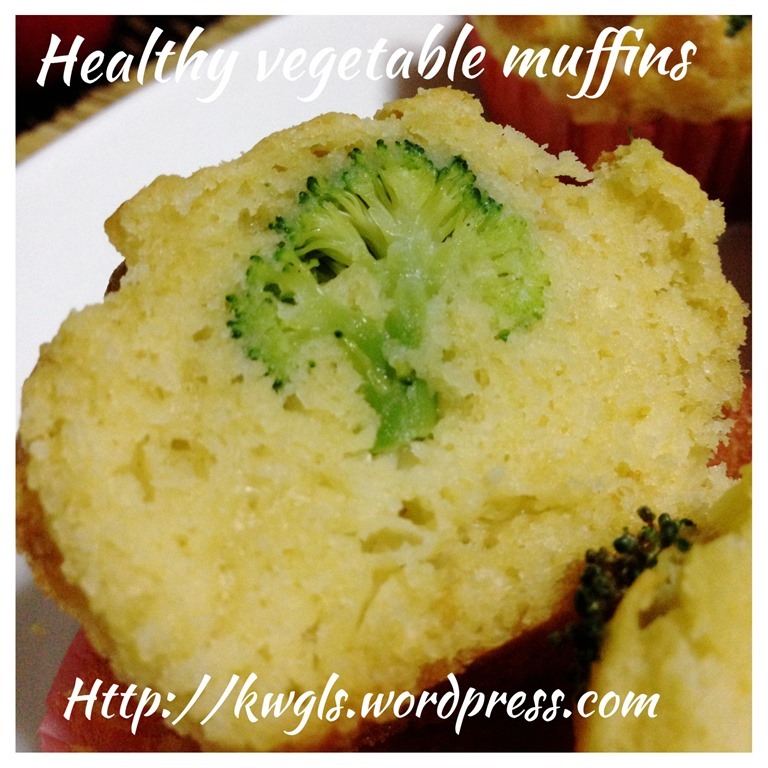 This entry was posted in Cakes and cookies, Food Preparation Series and tagged 8, brocolli, Guaishushu, healthy vegetables muffins, kenneth goh, one number baking ratio, postaday, vegetable muffins. Bookmark the permalink. They look delicious. And the little !! addition made me giggle. 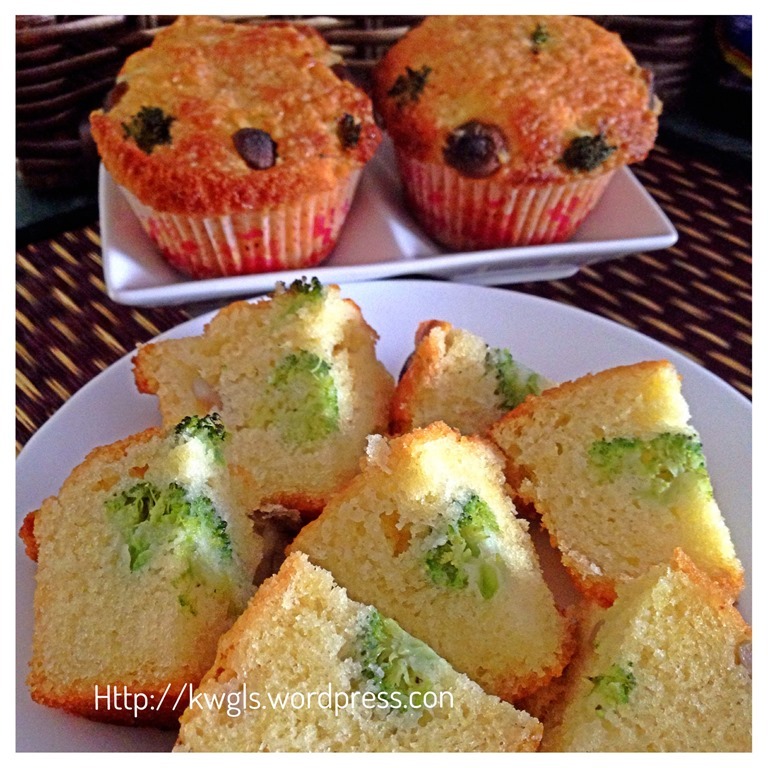 I love savory muffins and scones, so I’m sure I would enjoy these. You have me curious how you accidentally added “! !” to a picture! I wish you would tell us the rest of the story 😉 Thank for sharing this tasty recipe at Saturday Night Fever! 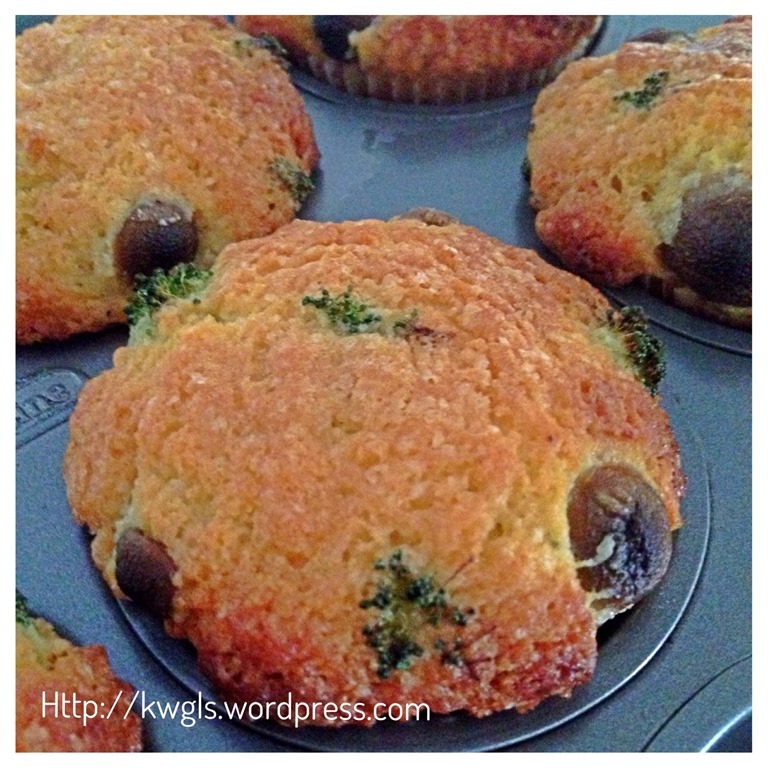 Thank you for coming by and linking up with us for Mindful Mommy Monday link up party! I love these! I am pinning them today too!